Paneer Pizza is equally appealing to vegetarians and Non-vegetarians alike; a wholesome meal to make your happy meter high! Pizzas always lift the celebration spirits and homemade Paneer Pizza, fresh from oven is welcomed with all hands reaching out for a slice. In India, Pizzas are very popular and American Pizza chain outlets like Pizza Hut, Domino’s etc. are found all over India. They have even changed their menu with Indian style toppings like Chicken Tikka Pizza by adding more vegetables and Paneer to suit the Indian crowds. 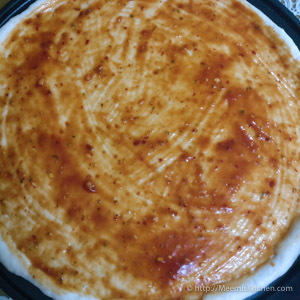 Although, the Pizza base recipes remain the same, the toppings are what makes the Paneer Pizza unique and flavourful. The right combinations are very essential so as not to overpower any ingredient, instead, it should enhance the combined flavours. This cheese rich Paneer Pizza recipe is absolutely tempting and delightful. I have added chilli flakes to this Paneer Pizza to make it more appealing and delicious. If you are concerned about using Maida alone for Pizza base, try my whole wheat Pizza recipe. Stuffed Garlic Bread is yet another popular recipe at home. Also, try my sausage rolls, Crescent rolls, celebration cakes, tea cakes etc. For fried snacks and starters for get-togethers and parties, check cutlets, samosas, fish fingers, squid rings, fried spicy cones, spring rolls, Egg Puffs, Chicken Momos, Donuts, Meat rolls and so on. There is a wonderful collection of recipes, sure to enthrall your kitchen, like it did for mine. For Paneer / Cottage Cheese lovers, this Paneer Pizza is a perfect treat, like Paneer Puffs. I have a good collection of Paneer recipes- Paneer gravies, Paneer cutlets and Paneer Pulao. It gives me immense pleasure when you read, try out and comment on my recipes about how it came out for you. I really appreciate when you take time to comment on my recipe and acknowledge my efforts. 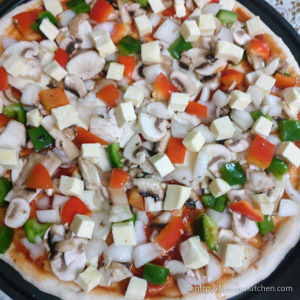 For now, check this soul warming recipe for a cheesy ensemble – “Paneer and Mushroom Pizza”. Enjoy! Warm Milk/ Lukewarm water : as required for kneading. White Onion : 1 no. Mix the flour, milk powder, baking powder and salt very well. In a cup add yeast, sugar and little Luke warm milk/ water and mix well. Keep aside. Make a well in the center of the flour and pour the yeast mix and gently combine. Add more lukewarm water to make a smooth dough. 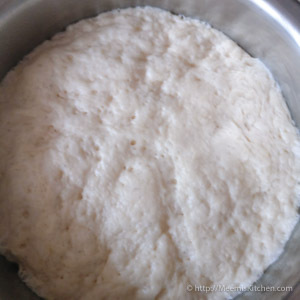 Apply oil and knead for some time, till you can feel that the dough is smooth and soft. (For more pics check link : Vegetable Pizza) Rub little oil in your hands and roll the dough into a ball, cover and keep for 1 -2 hours, till the dough is double in size. Divide the dough into three equal portions. Take one portion and make a ball, dust with flour and roll into a round shape using a rolling pin. 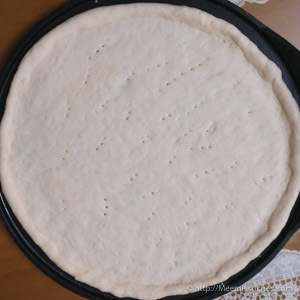 You can make thin crust or thick crust as per your liking. Poke the base with a fork. Transfer to a baking tin and keep aside. Roll the other two portion the same way and keep it ready. 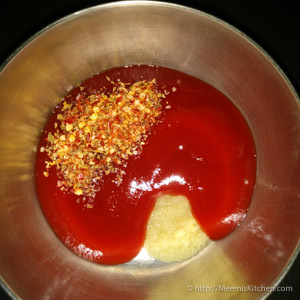 In a bowl, mix all the ingredients for Pizza sauce and combine well. 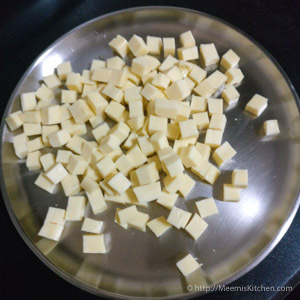 Cut the Paneer into small cubes. 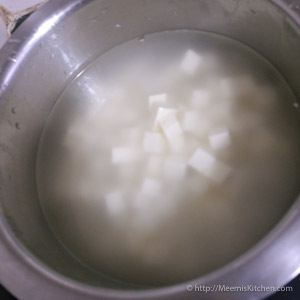 Put the Paneer pieces in very hot water for few minutes and drain. 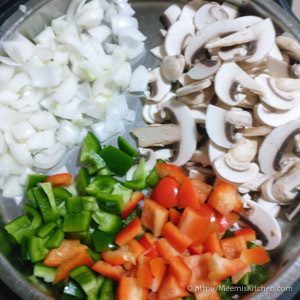 Slice the mushrooms, onions and capsicum and mix with salt, oregano and Chilli flakes. Grate the cheese and keep ready. 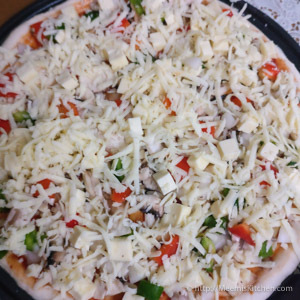 Spread the Pizza sauce on the Pizza base, cut and spread the cheese slices and spread the vegetables and paneer on top. Cover with cheese. Sprinkle more Chilli flakes and oregano on top and bake in a preheated oven @ 180o C, for 20 minutes or more. The cheese on top should melt evenly. Take it out, cut into triangles with a Pizza cutter and enjoy the irresistible Paneer Pizza! Paneer should be kept in hot water to make it soft. Always use a good brand of Mozzarella cheese for pizza. I have used plain cheese slices in this recipe, for extra cheesy Pizza. You may avoid it if you want to cut down on calories. Instant dry yeast is used in this recipe. If you are using dry yeast you must keep it for rising in lukewarm water. Only Lukewarm water should be used to knead. If the water is too hot, the dough will not rise. Poking the base with a fork prevents air bubbles. Too much water also causes bubbles while baking. Chilli flakes and oregano are used for seasoning. Add according to your taste. 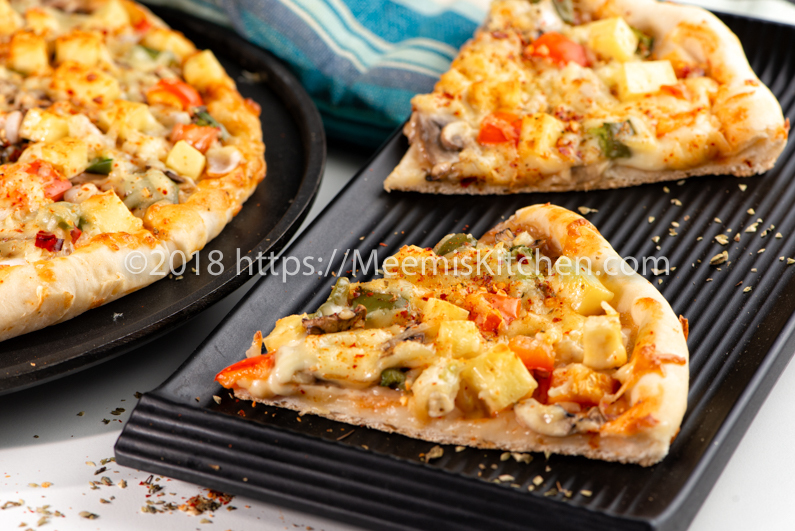 Please try this Paneer Pizza and let me know how it turned out for you through comments and share with your friends using the share buttons below. It would definitely encourage me. Thanks and God Bless! !